As a result of joint efforts by Japanese, US and German scientists, the Dosimetry System 2002 (DS02) was developed as a new dosimetry system, to evaluate individual radiation dose to atomic bomb survivors in Hiroshima and Nagasaki. Although the atomic bomb radiation consisted of initial radiation and residual radiation, only initial radiation was reevaluated in DS02 because, for most survivors in the life span study group, the residual dose was negligible compared to the initial dose. It was reported, however, that there were individuals who entered the city at the early stage after the explosion and experienced hemorrhage, diarrhea, etc., which were symptoms of acute radiation syndrome. 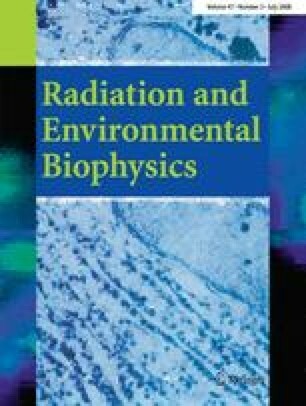 In this study, external exposure due to radionuclides induced in soil by atomic bomb neutrons was reevaluated based on DS02 calculations, as a function of both the distance from the hypocenters and the elapsed time after the explosions. As a result, exposure rates of 6 and 4 Gy h−1 were estimated at the hypocenter at 1 min after the explosion in Hiroshima and Nagasaki, respectively. These exposure rates decreased rapidly by a factor of 1,000 1 day later, and by a factor of 1 million 1 week later. Maximum cumulative exposure from the time of explosion was 1.2 and 0.6 Gy at the hypocenters in Hiroshima and Nagasaki, respectively. Induced radiation decreased also with distance from the hypocenters, by a factor of about 10 at 500 m and a factor of three to four hundreds at 1,000 m. Consequently, a significant exposure due to induced radiation is considered feasible to those who entered the area closer to a distance of 1,000 m from the hypocenters, within one week after the bombing.